By Peter Anderson 2 Comments - The content of this website often contains affiliate links and I may be compensated if you buy through those links (at no cost to you!). Learn more about how we make money. Last edited May 31, 2018 . A few years ago Betterment.com launched with the promise of making investing easy for busy people. They offered a platform that allowed you to transfer your money in, choose a ratio of stocks to bonds for your investments and then basically set it and forget it. They invest primarily in low cost ETF index funds, and give you a diversified and regularly rebalanced portfolio without any work for you. When they first launched their fees were a bit high, and at the time it was a keeping quite a few people away, including myself. Shortly after their launch, however, they revised their fees, and made them much more reasonable. 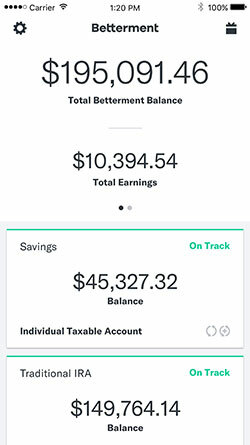 I've been using Betterment for many years now myself, and I've been very happy with the service. Recently, it just got even better. 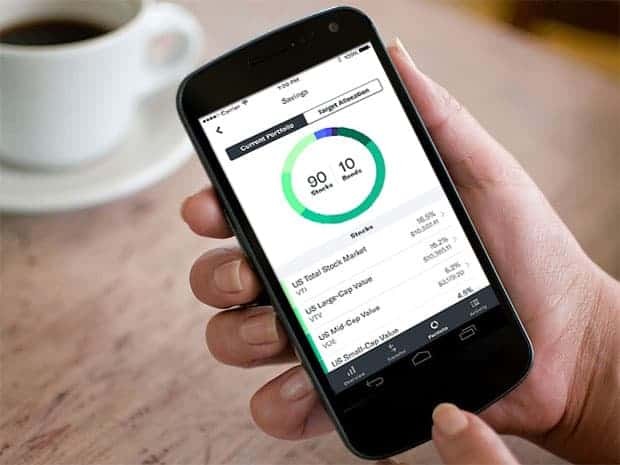 Betterment has just released a new set of mobile apps for iOS and Android platforms. Here's what I think. What Can You Do With The Apps? Betterment has actually had an app for iOS users for quite some time now, but an Android version has never been released. With the latest update not only has Betterment updated the iOS app to make it more user friendly and optimized for iOS 9 (and give it support for the newest iPhones), they've also finally released the long awaited Android app! I've been waiting for the Android version for some time, so I was happy to finally see that it was being released. So what will the apps allow you to do? What functions will they perform? 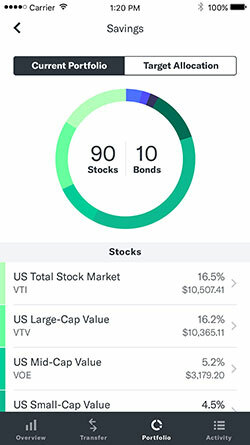 Check the balance and returns of your portfolio in real time. Deposit and withdraw money anywhere, any time. Manage your portfolio’s stock and bond allocation. Review your goals and account activity. Refer Betterment to your friends and family. At first my tablet wasn't supported. After inquiring with the Betterment team about it, I was quickly notified that an update had been pushed and several other phones and tablets were now supported, including mine. I confirmed that the Nexus was now supported, and installed the app. My other devices, Motorola Moto X, Moto X 2nd Gen and Samsung Galaxy S5 were supported without issues. After installing the app I thought I'd do a quick walkthrough to see what the app looks like and what you can do with it. 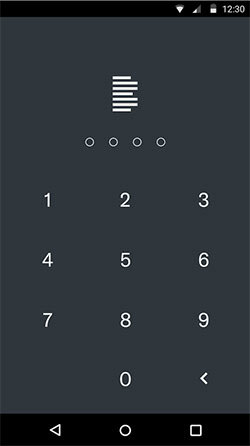 When you first login to the app, you'll be taken to your investment account's summary page. There it will give you an overall summary of your account, and then break it down into your separate accounts and goals that you have setup. In my account there is the regular investment account, and the Roth IRA account. Once you click into one of your accounts, it will take you to a detail page for that account where it will give you a summary of how much you have invested, your returns and earnings. From there you can move on to several other tabs within the app. There is a tab to transfer funds, a tab where you can change your portfolio allocation and a tab where you can view account activity. On the transfer tab you can choose to transfer funds from your linked account to one of your investment goals. 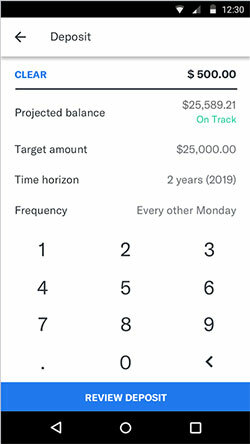 If transferring to an IRA or Roth IRA it will tell you how much you have left to transfer for the year within your Betterment account of your $5500 total for the year. In my case below it still shows $5500 since I haven't deposited any money there this year (since we were saving for a house down payment). On the Portfolio tab it will allow you to modify your allocation for your account of stocks to bonds. Obviously this isn't something you're going to probably do on a regular basis, but if you want to, it's available. This is how android mobile poker sites apps works when it comes to playing poker on mobile. The final tab allows you to view account activity including transfers, stock transactions, withdrawals, etc. The apps don't do anything fancy, and they aren't going to wow you by any means, but they do look nice (both on a tablet and smartphone), and they get the job done. You're able to do all the major functions that you should need to with your Betterment account. 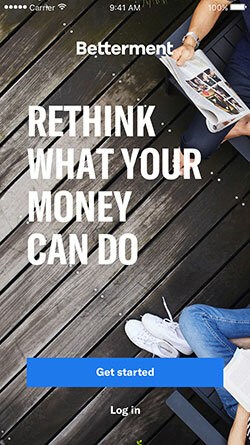 You can check your account's performance, transfer funds, change allocations and check account activity. In short, the apps are simple and effective, much like Betterment as a whole. Thinking about signing up for an account? I highly recommend it, and use Betterment for my own investing. Last Edited: 31st May 2018 The content of biblemoneymatters.com is for general information purposes only and does not constitute professional advice. Visitors to biblemoneymatters.com should not act upon the content or information without first seeking appropriate professional advice. In accordance with the latest FTC guidelines, we declare that we have a financial relationship with every company mentioned on this site. Great review, Peter! I have not used Betterment but have it on my “to do” list to check out what they offer. It’s great that they have a new Android app, as some companies seem to only roll out apps for Apple. Timely review. Like DC, I’ve been thinking about checking out Betterment. I don’t use that many apps, so that wouldn’t be a deal breaker for me, but I think I’m probably not in the majority there.